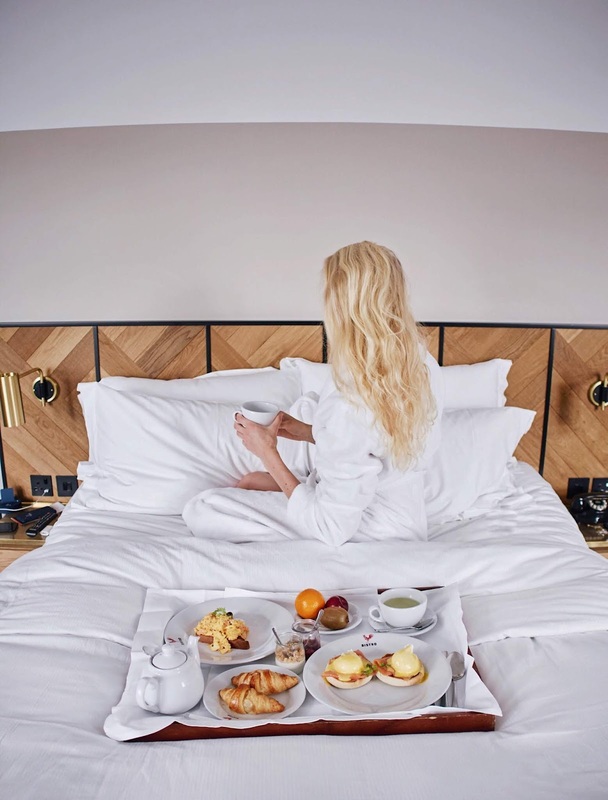 Our next stop in London was at Victory House Leicester Square: a chic boutique hotel in the heart of London's west end, located really close to vibrant China Town. Because of the location it was possible to explore most of the London highlights by foot - like the Big Ben, London Eye, Buckingham Palace and Westminster Abbey. What I loved the most about our stay at Victory House was the breakfast. Normally we actually like to go out of our room and have breakfast in the breakfast area, but this time my boyfriend and I were super lazy and decided to order room service. There were so many delicious things to choose from on the breakfast menu, which made it so so hard to make a final choice. In the end I went for the poached eggs with smoked salmon on an English muffin, while Cornell had some scrambled eggs with salmon on toast. Next to this we also ordered some pastries, fresh fruits, a smoothie, fresh mint tea and yoghurt with granola - all so good! In the evening we were invited for dinner at Petit Bistro, which is the hotel restaurant. The bistro was serving delicious French food. As a main course we enjoyed a few glasses of vin rouge, steamed mussels, french fries and chicken with vegetables, after which we had a delicious cheese platter and creme brûlée for dessert. After dinner we headed for our room to recover from our after dinner dip and to relax a bit on the comfortable bed. The atmosphere and interior of our room were beautiful and definitely my cup of tea. Give me some velvet chairs, wooden furniture and golden details and I'm yours - loved it! Last but not least the staff of Victory House was very friendly and helpful at all times. Because of this our stay went smoothly, making our weekend in London even better.